Spring is in the air and the home buyers are out in San Ramon. 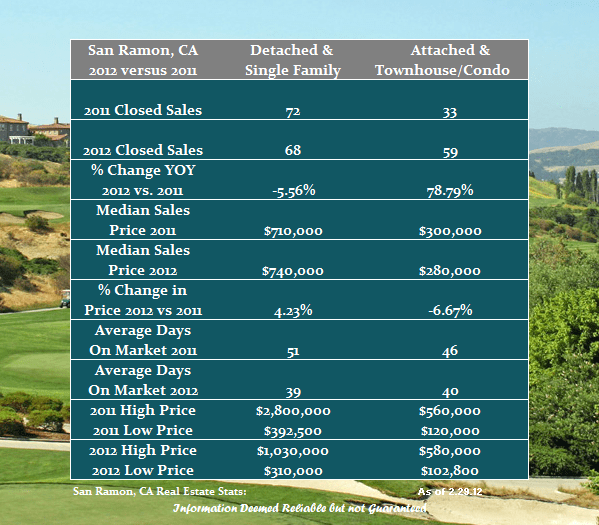 Let’s review the San Ramon Real Estate Market first two months of 2012 versus the same period of 2011. The pace of single family home sales is very similar to 2011 and we have seen a slight “pop” in median price. The real standout is the dramatic increase in attached home sales. In both segments we have seen a decline in the time it takes to get a home into escrow. Things are busy out there right now and we are seeing a lot of multiple offer scenarios and a little more inventory would be a welcome sight. We will see how the first quarter of 2102 does in a couple of weeks. Share the post "February Real Estate Review for San Ramon"